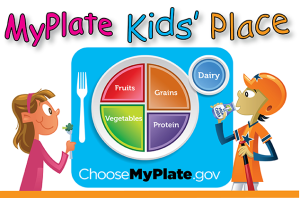 MyPlate Kids’ Place is OPEN! The doors to MyPlate Kids’ Place are open! Kids will find games, videos, songs, activity sheets, recipes, and tips to help them eat healthier and move more. Parents and teachers will find new ways to help kids make healthier food and physical activity choices. Teachers and professionals can also add the resources to summer camp and back-to-school efforts.